Do you find yourself needing more balance in your life? I know I do. With all of the stress that our daily life puts on our bodies its a wonder that we are able to function at all. Even though our bodies can take quite a lot, it doesn't mean that we should let them, maybe what you need for Christmas this year is a way to put your body back into the balance it was meant to be in. The best way to do that is with The Essential Ayurvedic Cookbook by Lois A. Leonhardi. Lois is a certified Ayurveda practitioner, educator, and author. She also has over 15 years of experience in holistic studies including ayurveda, yoga, and Buddhism. Now, Ayurveda is a Sanskrit word meaning "science of life or longevity" and it is means to teach us about the energies that play in our bodies and how living and eating a certain way can help balance those energies out and optimize your health. Ayurveda originated in India and many refer to it as the fountain of youth. The recipes are designed for everyone so knowledge of ayurveda isn't required and there are recipes for non-vegetarian, vegetarian, gluten-free, soy-free, and even dairy-free individuals. 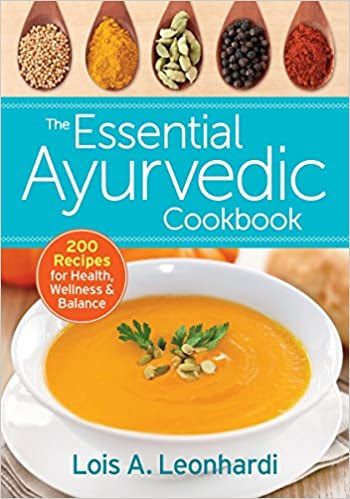 Whether you are interested in the Ayurvedic lifestyle, or whether you are just trying to improve on your eating habits, The Essential Ayurvedic Cookbook is the book to help you achieve balance in all things, starting with your diet.